Kevin Keen ummed and ahhed and avoided the question. This was way above the pay grade of a West Bromwich Albion assistant manager. He knew the answer, and the answer was yes, but there was no way he could say that. It would be presumptuous, and arrogant, and worse, it might come back to haunt him. So he did what he could. He ummed and ahhed and avoided the question. The question, put to him live on national radio, was this. Had Steve Clarke’s side, despite what might be termed an inconsistent start to the season, gone to face Manchester United at Old Trafford on Saturday convinced that they could take advantage of the uncertainty which has engulfed the Premier League champions since the departure of Sir Alex Ferguson and the arrival of David Moyes? Keen’s answer does not need to be repeated in full, but it was along the lines of Old Trafford is still a difficult place to come, Moyes is a good manager, he’s sure he will get it right, but that it is always difficult to replace someone as successful, as iconic, as Ferguson. That was not far off all Keen could say, because the real answer would have been much shorter, and much more damning. Yes, West Brom went to Old Trafford with an extra spring in their step because Moyes does not have the aura that Ferguson did. Yes, West Brom’s game plan was to do all they could to play on the doubts and the nerves and the fears which have hamstrung Moyes’ start to his new job, his new life. Yes, West Brom thought United were there for the taking. And they will not be the only ones. Manchester United have now lost three Premier League games of six, at Liverpool, at Manchester City and now at home, to West Brom. They won, impressively, at Swansea, and less impressively against Crystal Palace, and picked up a draw from an Anschluss sort of a game with Chelsea. They are 12th in the nascent table, between Cardiff and Swansea. It is not, make no mistake, an appalling start. United, as Jose Mourinho rather nobly pointed out last Friday, have endured a run of games that Moyes must have cursed: away at Liverpool, away at City, home to Chelsea. Even Ferguson would not have fancied his chances of sitting top of the table after that little sequence, and it’s not like he was immune to slow starts: At this stage last year, United had lost to Everton and to Tottenham, and it is just two years since the Scot’s side were dismantled 6-1, at home, by City. Moyes has begun the campaign poorly. That is not exactly rare. But there are two crucial differences. One is that Moyes’ side have no ostensible plan. It is hard to see exactly what he is trying to accomplish. They are not the free-flowing outfit which characterised Ferguson, but nor are they a Moyes team: The chaos of their defensive performance against Clarke’s players proved that. There are a number of question marks over Moyes’ capacity to do the United job, but whether he can put out a well-organised, disciplined, diligent side is not one of them. Those three adjectives basically sum up his time at Everton. The second, though, is more worrying. 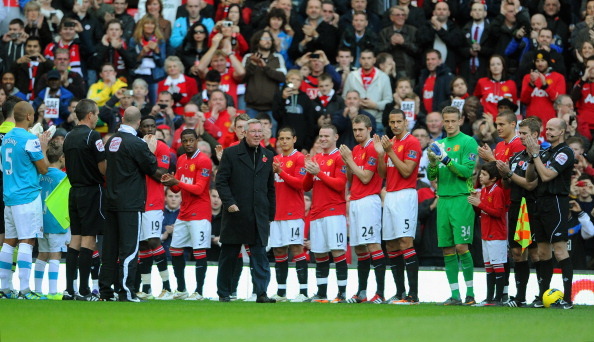 It is that Ferguson is not there. That is why — even though we are but six games into the season — Saturday’s defeat felt significant. Ferguson’s United teams made a habit out of snatching victory from the jaws of defeat, conjuring late winners and mounting nerve-shredding comebacks. They became, in a sense, a self-fulfilling prophecy. Teams tended to go to Old Trafford, take the lead, and look around in panic. They could feel the ripples in the water. Something terrible was coming. They retreated to the edge of their box, and cowered, hoping the worst would not happen, but knowing, deep down, it would. Without Ferguson, immediately, that fear has dissipated. That is not a slight to Moyes: it is understandable to question his tactical nous, his style of play, his ability to elicit the best from star players, but it would be unfair to criticise him for not possessing Ferguson’s aura, his pathological desire for victory, his talent for shaping his own destiny. Nobody in football can do that, not even Mourinho, nor Pep Guardiola. Ferguson alone possessed that. When he departed, he was always going to take it with him.